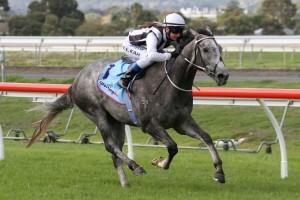 Trainer Leon Macdonald is confident that talented sprinter Daytona Grey will again perform out of his skin in Saturday’s featured Group 3 Bletchingly Stakes (1200m) at Caulfield Racecourse. Daytona Grey has only made two appearances at the races in 2017 so far, but has performed to a typically high standard; running fifth in the Holdfast Insurance BM90 (1050m) first-up on June 24th before running a smart second behind Supido in the Group 3 Sir John Monash Stakes (1100m) a fortnight ago. Macdonald was understandably thrilled with the veteran grey’s performance last start and believes that there is no reason that he cannot emulate that run when he takes his position in the 2017 Bletchingly Stakes field. “I thought he ran his heart out and was just beaten by a better horse on the day,” Macdonald told AAP. “He’s pulled up well and he’s gone forward since. So we’ll keep our fingers crossed. “He would have to improve to beat the horse that beat him, I know, but the chance of maybe a wet track might help us. He loves give in the ground. Daytona Grey has been a strong and consistent performer for Macdonald and co-trainer Andrew Gluyas throughout his entire racing career so far and will take his position in the Bletchingly Stakes field with a commendable record of twelve wins and nine minors, from fifty-one competitive appearances. Resuming in 2016 for a smart win in the Listed Manihi Classic (1100m), the Artie Schiller gelding placed midfield in the Group 3 RN Irwin Stakes (1100m) before running second in the Group 3 DC McKay Stakes (1100m) and third in the talent-rich A Sheppard Constructions Handicap (12500m) most notably. Daytona Grey has drawn into the Bletchingly Stakes field on the rails and will be partnered by regular hoop Clare Lindop. Open an account and bet with Ladbrokes.com.au to take advantage of the best Bletchingly Stakes odds available online!